I wasn’t going to post on this, but after spending a big chunk of time while laying in bed not feeling well scouring the inanely awesome Nordstrom Half-Yearly Sale I figured I should probably share my finds and hopefully save some others the time spent going through the pages upon pages of product included in the sale. The best deals I found were on toddler girl clothes. So. Much. Peek. I’m obsessed – it’s all so cute and the prices are amazing. There are also some discounts to be found on baby products like Honest Diapers and baby gear like the ERGObaby 360. I also found a great price on what I know is a highly sought after Burberry jacket for women at 30% off. Looks like an awesome push present to me (wink wink, nudge nudge husband). 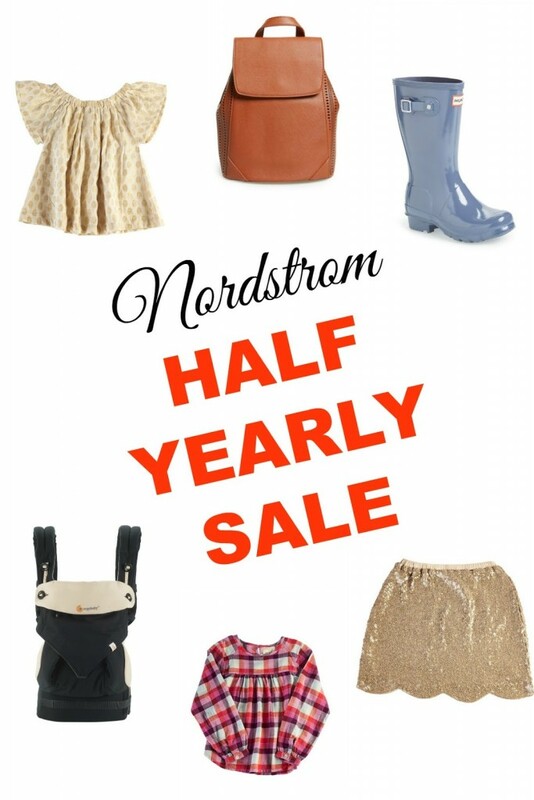 As far as women’s clothing there’s not a ton that I loved but but there are a ton of great accessories and shoes included in the sale. And there are awesome deals on men’s clothing from my husbands favorite brands so he did some shopping for himself! Check out the widgets I made below with my favorite finds! These are some great pieces! Thank you for sharing them. I wish I had seen this sooner – my niece would fall in love with that adorable skirt. Happy Holidays!